Tom Turkey is a plush fabric covered turkey with floppy legs and sewn on plush wings. His body is covered in an ivory herringbone fabric, while his head and legs are covered in a brown herringbone fabric. 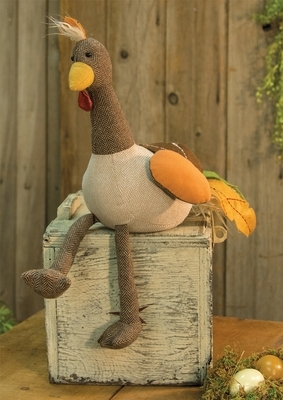 He is decorated with multi-colored felt feathers and sprouts of fluffy soft feather-like material on his head and tail. His body is weighted, so Tom can easily sit anywhere. His height when sitting is 12in tall and he's 8.5in wide. Designed by Kitty Johnson.